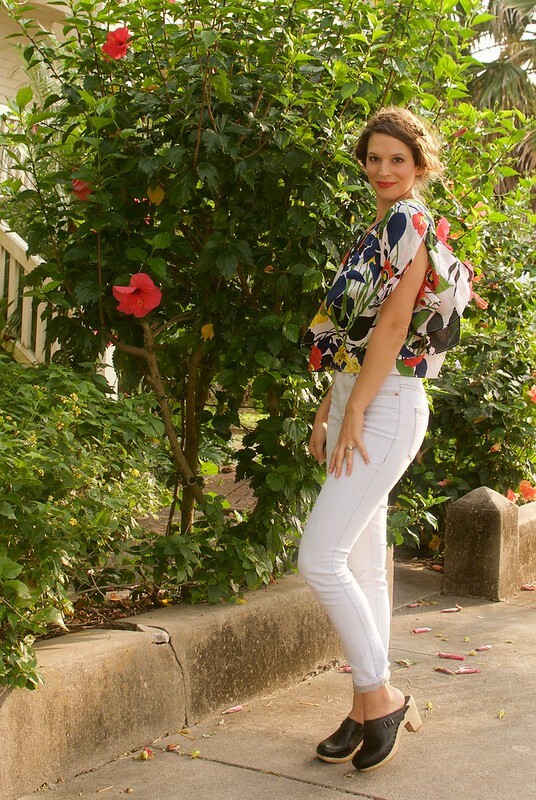 Home Mood Sewing Network	Bright Floral Top for Spring! Hi Everyone! I hope if you’re in the northern hemisphere you’re starting to feel the presence of spring! Here in my little corner of Texas we like to skip the whole transitional season thing and move right into summer. After living here for 6 years I’ve finally resigned myself to this and just accepted the fact that I shouldn’t become to invested in cold weather sewing. 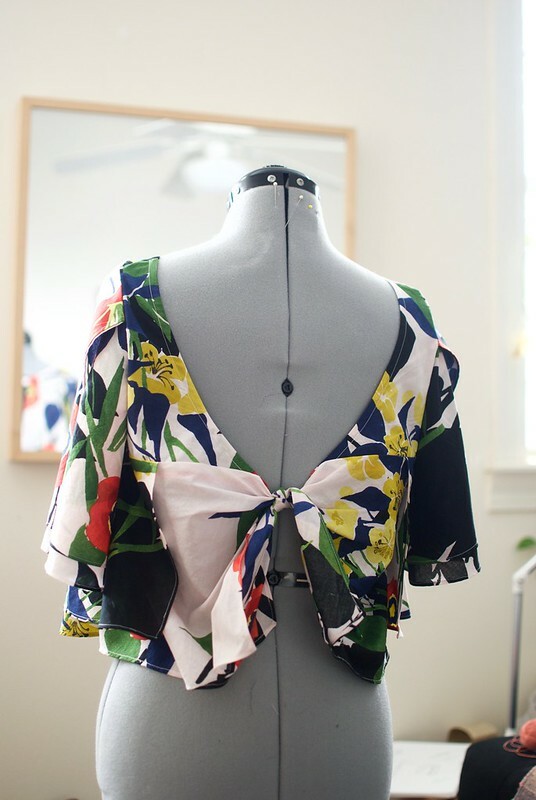 The truth is I will always get much more wear out of an extensive warm weather wardrobe than I will wool coats – no matter how fun they are to sew! This month I present to you this fun and fabulous little floral topper! I feel a bit silly calling it a “shirt” or even a “top” as its open-back, apron style makes it feel like I’m hardly wearing anything at all! 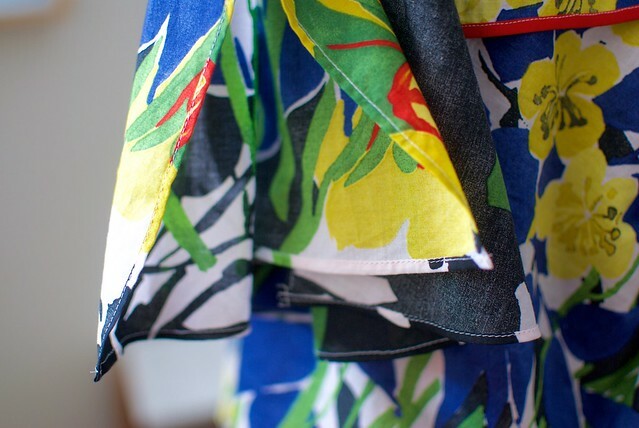 For this make I used this gorgeous Italian Black/Blue/Green Floral Printed Cotton Batiste from Mood Fabrics online, which is now, sadly, sold out. However it’s sister colorway seems to still be kicking! This fabric was truly delightful! 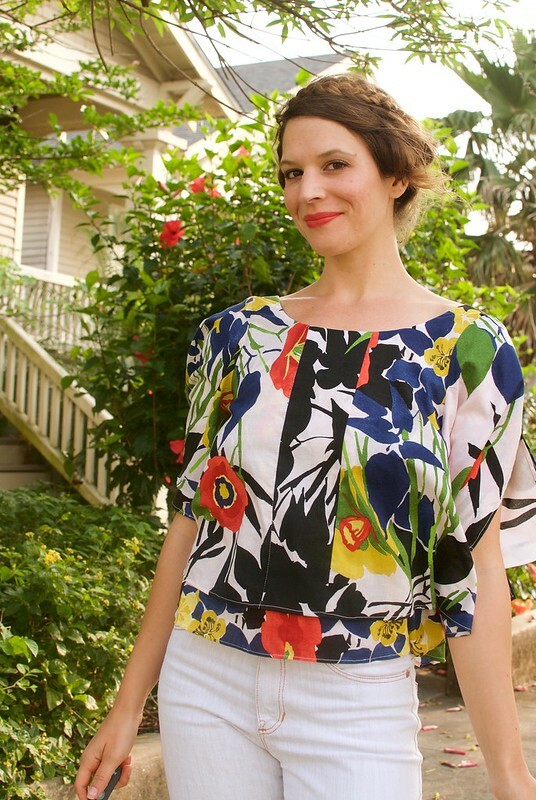 After all, what’s not to like about cotton batiste in a bold, charming, painterly floral? Easy to cut, easy to press, easy to sew, and easy on the eyes. I adored this fabric. Right off the bat I knew I wanted to pair this fabric with Vogue Patterns #1507. 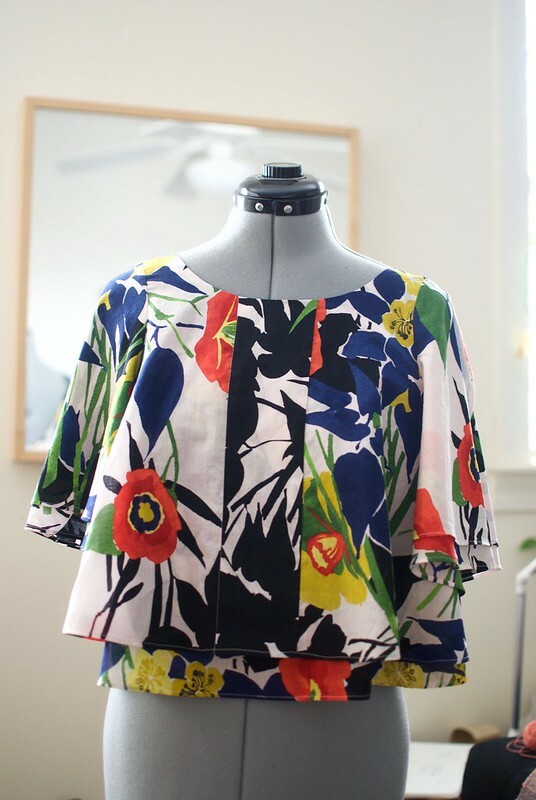 This was a new pattern from designer Rachel Comey, who is one of my favorites, and the design just immediately caught my eye as something different. 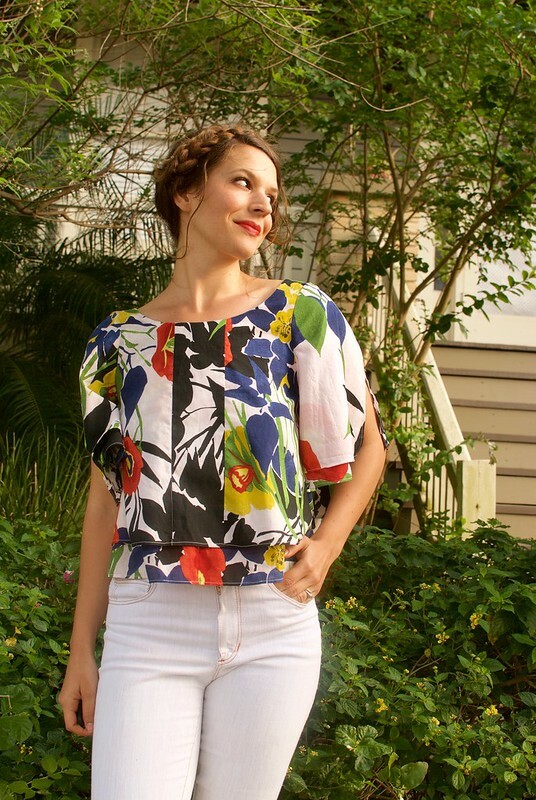 The version on the pattern envelope is lovely for showing off the style lines of this top, but in my heart I felt like this shirt longed to be made up in a loud print, perhaps to give it a bit of a Carmen Miranda flair! I didn’t bother with print matching for this make, instead I rather liked the haphazard way the print fell across the bodice and sleeves. And since the shirt is double layered I love how bits of the pattern peak through some of the sheer-er areas of the top layer. 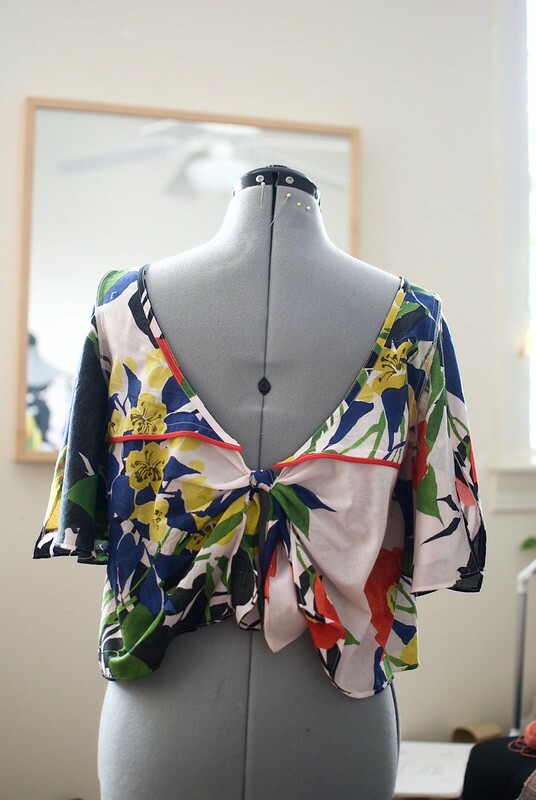 The pattern calls for french seams on the front of the bodice, a small bias cut facing for the back neckline, and bias binding for the back yoke and sleeves, however I finished my sleeves on my serger instead. And here’s a closeup of those teeny hems!! Truly, this was the bulk of the sewing! As you might imagine, choosing a thread color for this project was a bit of a nightmare, since no matter what color I chose it was going to contrast with the print of the fabric at some point. I settled for off-white, and I think it looks okay, however an invisible, hand-rolled hem would probably have been more elegant. Nevertheless I don’t think the stitching detracts from the finished piece. 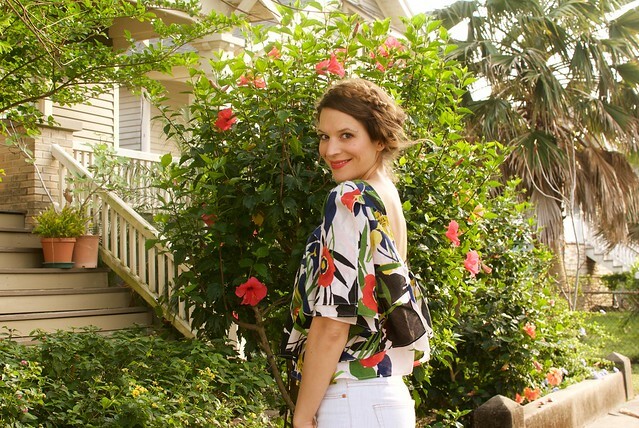 All in all I love this fun top! It’s a really great statement piece, perfect for dressing up basics. 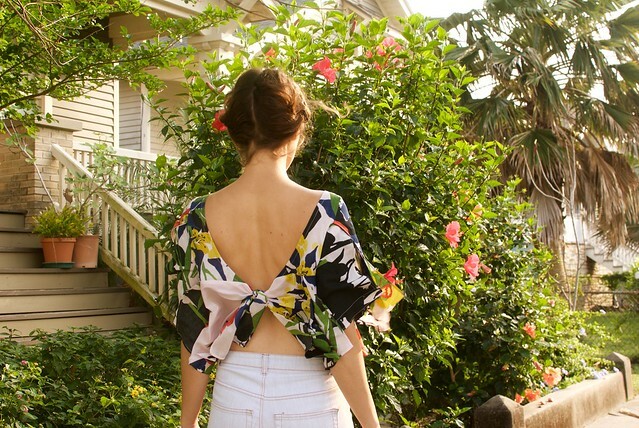 And the open back and “I feel naked but I’m not” vibe of this top is, I’m sure, going to be appreciated once the dog days of summer really set in!